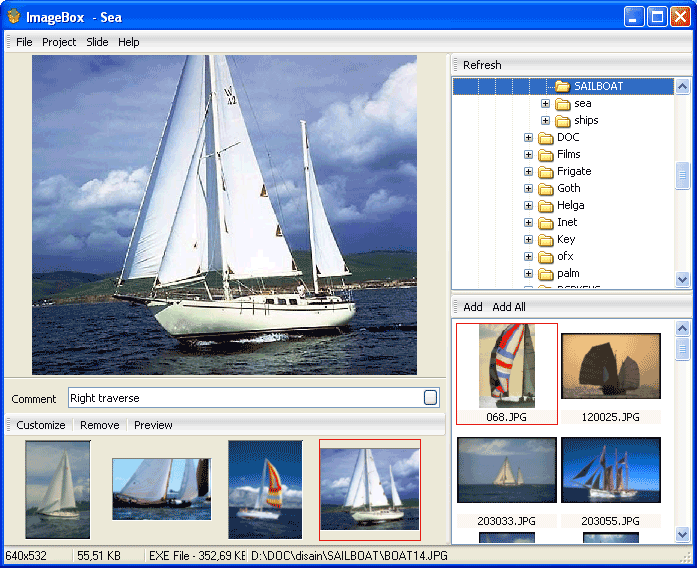 ImageBox - your friends and colleagues will appreciate it! It creates a slide show of your photos, images and music as stand alone EXE. Do you find it difficult to share your photos with your friends? How wonderful it would be if you could come to your friend, insert a disk and enjoy your photos accompanied with the proper music. And all this not depending on the type of your friend's pc and the viewers it has on. Qweas is providing links to ImageBox 1.01 as a courtesy, and makes no representations regarding ImageBox or any other applications or any information related thereto. Any questions, complaints or claims regarding this application ImageBox 1.01 must be directed to the appropriate software vendor. You may click the publisher link of ImageBox on the top of this page to get more details about the vendor.